The daily schedule has been specifically designed to accommodate the core objectives of this teacher training course. 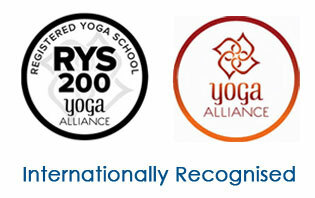 Through this schedule you will complete the 200 hour syllabus of training in Ashtanga Yoga, over 4 weeks. The schedule is subject to change and modification based on the hour breakup requirement as set out under Yoga Alliance standards. The opening ceremony is a yajna or a fire ritual where fire is used as vehicle to make yogic spiritual offerings to make the course smooth and successful. We highly recommend that you ensure attendance in time for this ceremony and gain blessings for a successful course. Your attendance will count towards your overall performance in the course. The group transfer arranged by Ajarya is timed so that you are well in time for this ceremony. The opening ceremony is a yajna or a fire ritual where fire is used as vehicle to make yogic spiritual offerings to make your yoga living progressive and smooth. We highly recommend that you ensure attendance in time for this ceremony and gain blessings for a successful course. Certificates are awarded in this ceremony only.